Joe Engel's story begins in the small town of Zakroczym, Poland. Joe grew up in a close-knit, mixed community, where Jewish and non-Jewish people were often friends and neighbors. His family was large (he had eight brothers and sisters, including Irene), and although luxuries were few, they lived simply and comfortably. In 1939, when the Germans invaded Poland, everything changed. Joe experienced the misery of a ghetto, concentration camps, and the death march of Auschwitz before he finally escaped from a cattle train in 1945. The only surviving members of his immediate family were two brothers and a sister. The Zakroczym that Joe knew does not exist anymore; it was rebuilt after sustaining heavy bombing during the war. Today, Joe lives in Charleston, South Carolina. He is extremely active in the community and speaks regularly to classrooms and schools about his experiences. A 1997 oral history interview with Joe Engel is available from the Lowcountry Digital Library at http://lcdl.library.cofc.edu/lcdl/catalog/lcdl:11820. The video documentary For Every Person There Is a Name, featuring three Charleston-area Holocaust survivors, including Joe, is also available. 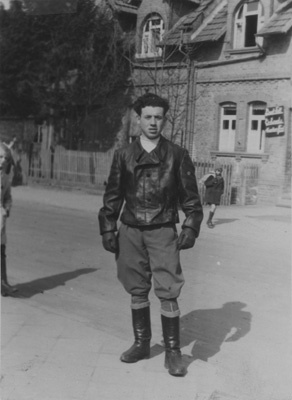 Joe studied auto mechanics in Frankfurt-on-Heine while living in Salzheim, the D.P. camp; 1946.